For more than a decade, Harry Norman has been selling bananas produced by Lebombo Growers at the Cape Town Market. Working with bananas throughout his career as a market agent, Harry has been dedicated to his producers and buyers in ensuring they receive the best possible service. At an award ceremony held in Cape Town, Lebombo Growers honoured Harry when he received the “Market Agent of the Decade Award 2001 – 2011” from the CEO of Lebombo, Corne Bouwer, on behalf of its board of directors. 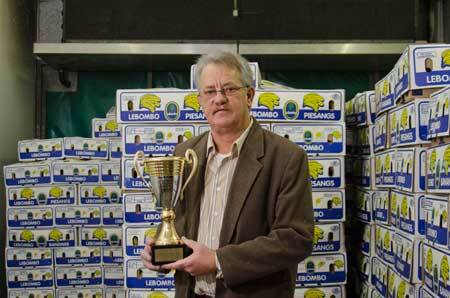 The award was an acknowledgement of Harry’s long and successful relationship with Lebombo Growers and for the consistent growth for the brand that Fine Brothers has achieved for Lebombo Growers in the Western Cape. The Cape Town Market salutes Harry for achieving this prestigious award.